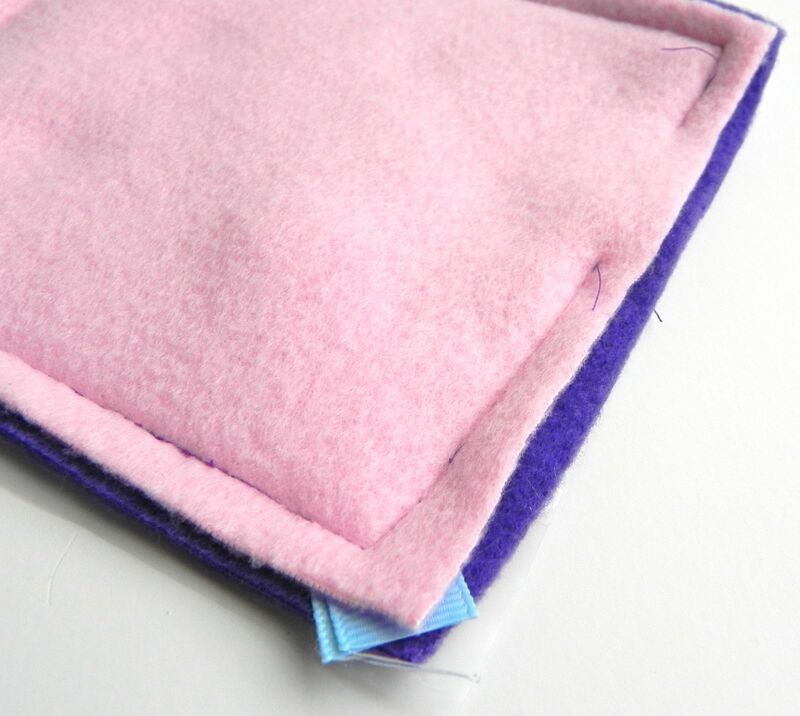 Here’s my tutorial for how to make a crinkle square toy for a baby. You’ll need fabric, some kind of crinkly plastic, ribbon, and thread. I used fleece fabric, an up cycled cereal bag (food grade plastic), grosgrain ribbon, and cotton thread. Using a walking foot with your sewing machine will help the layers move evenly through your machine. Cut a square of your plastic 6 inches square. Cut 2 squares of fabric 5 1/2 inches square. Cut a length of ribbon 5 inches long. The reason for cutting the plastic larger is that it can be very slick and can shift very easily while sewing. On the right side of one of the fabric squares, place the ribbon end in the corner and fold over. The loop will be towards the center. Pin it down. Pin the corners to prevent shifting. Sew around the edge about a quarter inch away from the edge all the way around. Leave a gap about an inch and a half wide to turn it right side out. Use a fairly long stitch so that you don’t perforate the plastic sheet. Clip the corners to allow for the corners to turn more easily. Turn right side out through the gap and poke the corners out with a turning tool, pencil, chopstick, or tool of choice. Top stitch along the edge, all the way around. You can make them bigger, smaller, with more loops, no loops, or in all manner of fabrics. Experiment colors and textures and have fun! 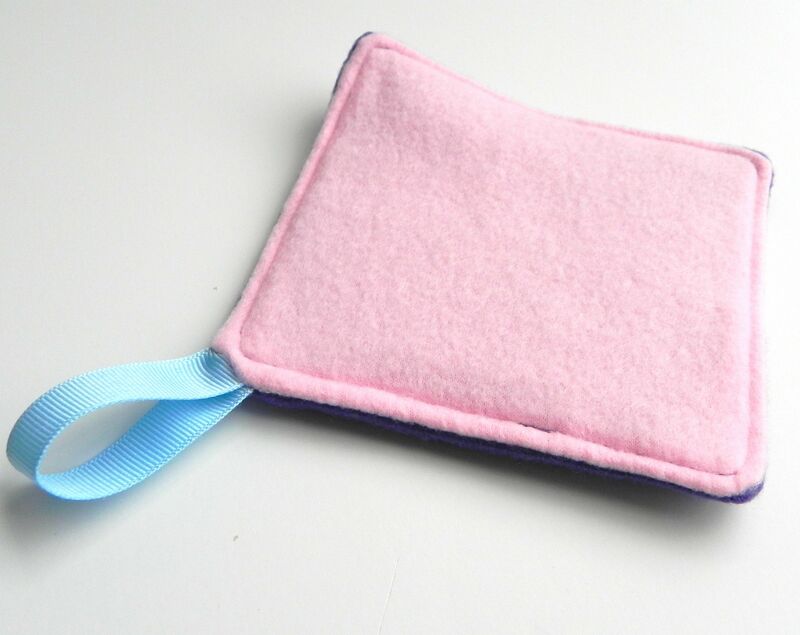 I’m planning to make an upcycled wool and cashmere one for my littlest babe. These are great for busy bag exchanges, baby gifts, or make for your own kiddos. As with all toys, babies and small children should be supervised during play. 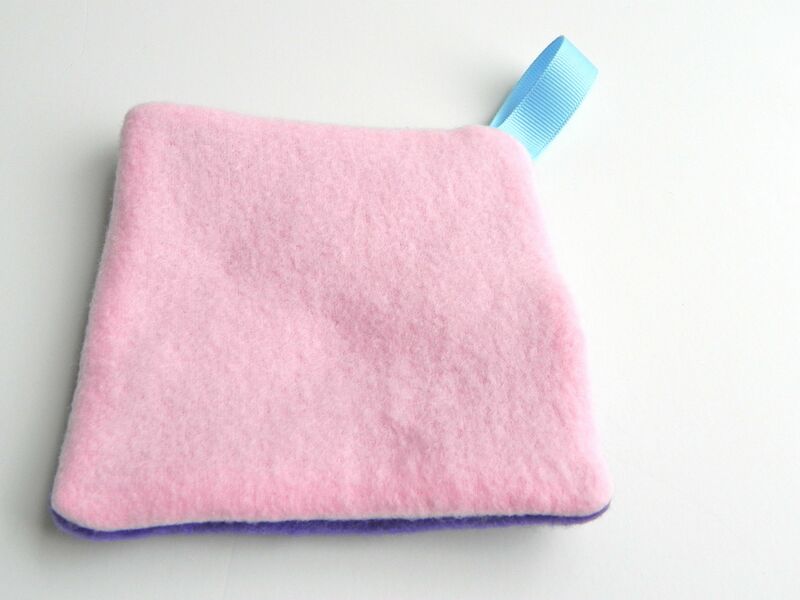 This entry was posted in baby, DIY, sewing, Toy, Tutorial, upcycle and tagged baby, Busy Bag, crinkle, fleece, infant, ribbon, sewing, Toy, tutorial, upcycle. Bookmark the permalink. What a great idea for baby gifts! These have been super popular with all my kids.